Early stage support groups | Alzheimer Society of B.C. Having a diagnosis of Alzheimer’s disease or another dementia impacts many areas of your life and people in this situation experience a variety of feelings. The reality of the disease can make it difficult to stay in touch with friends and family, and can lead to loneliness and isolation. Encouraging people with Alzheimer’s disease and other dementias to actively engage in protecting and maintaining their physical and emotional health. The opportunity to develop communication and problem-solving skills. 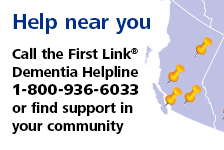 A place to access the most current information provided by the Alzheimer Society of B.C. It is important to recognize that support groups are not for everyone. Some people do not find group discussion helpful and prefer other forms of help, such as individual counselling or professional assistance. For information about Early Stage Support Groups in your area, please contact your local Alzheimer Resource Centre or see the First Link Bulletin for a list of upcoming dementia education and support programs in your community.